A Stafford accountant is returning to his sporting roots by sponsoring youth football at Stafford Town. Carthy Accountants are the new away shirt sponsors for Stafford Town Uunder-15s. “I have very happy memories of turning out for Stafford Town and it is great to be able to support them with shirt sponsorship,” said Rupert Carthy, founder and Director of the Eastgate Street, Stafford, based Carthy Accountants. “As a company with firm roots in the town, we support many local businesses and charities with business development advice. 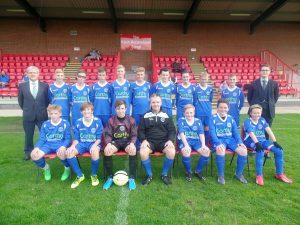 Stafford Town Under-15s play in the Mid Staffordshire League. For media enquiries please contact Nigel Howle by telephone on 0776 2043436 0r email nigel.howle@howlecom.co.uk. The eight-strong team provide a full accountancy service to businesses across Staffordshire and beyond.